I am a big fan of cooking from scratch and we do so most nights in the week. Sometimes though, there are those times when having something in the fridge to whip up quickly really is necessary whether you have been to the gym after work, gotten home late or are just too tired to faff on in the kitchen. 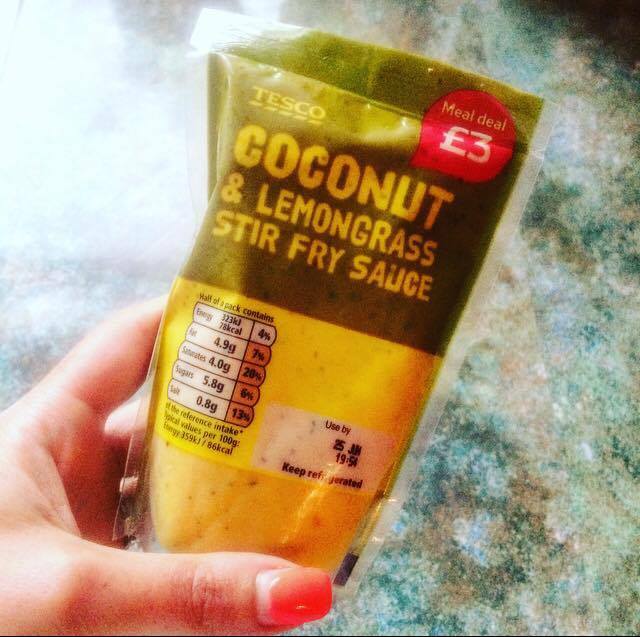 I’m always on the lookout for products I can involve in my cooking which are tasty, quick and low in Smart Points so my discovery of this lovely stir fry sauce in Tesco was a delight. I’m always dubious of ‘packet’ sauces as sometimes they can be watery, bland and tasteless but this one was quite the opposite. My husband, who isn’t usually a fan of coconutty dishes, wolfed this down in less than five minutes. 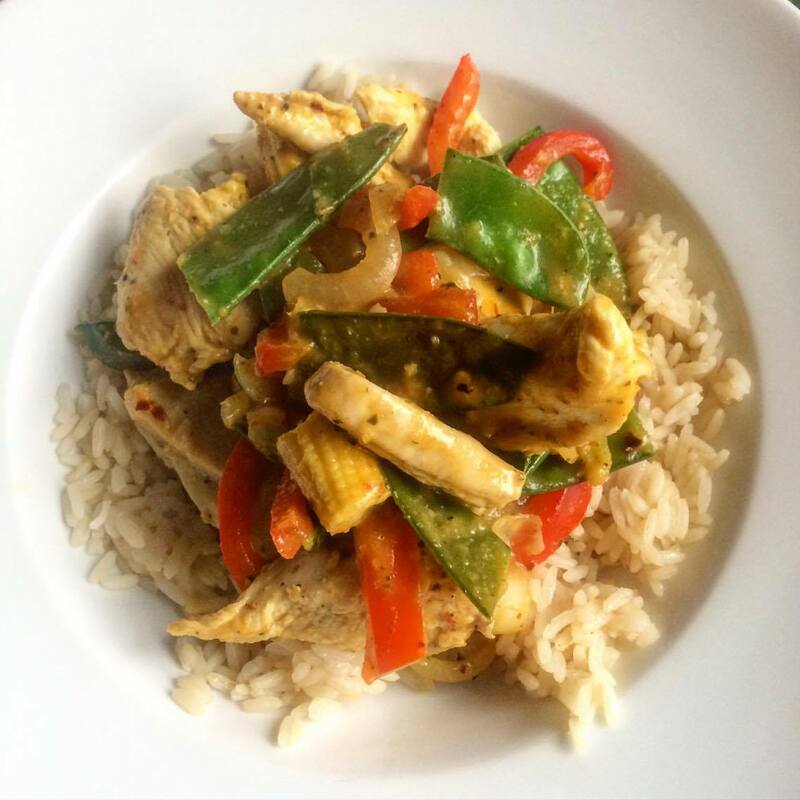 The best thing about this stir fry is that it can be made in the same amount of time it takes to cook the rice. Its a new favourite of ours as not only is the sauce only £1 but it lasts a good couple of weeks in the fridge and can even be frozen for use at a later date. Top tip: If you are really pushed for time (or just feeling a bit lazy) you could use a 100g packet of the microwaveable basmati rice for the same amount of points as that stated below. In a saucepan cook the rice according to the packet instructions. Next spray a large frying pan with 1kal, heat and fry the onion for 5 minutes until it starts to soften (add a little water if the pan gets too dry). Add the garlic, ginger and chicken, season with salt and pepper and fry for another 6-8 minutes until the chicken is cooked through. Add the pepper, mangetout and baby corn, fry for another 3-4 minutes (until the vegetables are cooked to your liking, I like them crunchy) and then add the packet of stir fry sauce. Turn the heat to low, add the crushed chillies and then season with salt and pepper to your taste. Simmer for a few minutes until the sauce has combined nicely with the vegetables. Drain the rice and pop into a bowl. Top with the stir fry mix. Finish with a sprinkle of fresh coriander. Looks lovely… but how many points for the pouch of sauce? Made this tonight and it was delicious but both my Weightwatcher scales and the barcode zapper on the WW app say that the 180g sauce pouch comes in at 8 Smart Points, making my meal a total of 11. Made this last Friday. Delicious. I used 100g more chicken just because of the pack size. Will be a regular on the menu from now on.